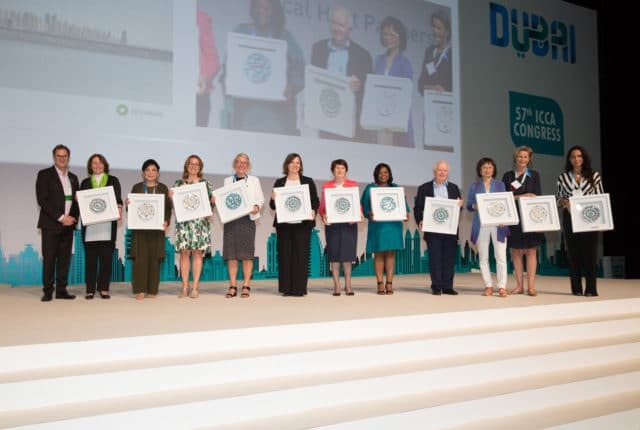 The International Congress and Convention Association shined a spotlight on the monumental contributions of women to the meetings industry at their 57th Congress in Dubai, with ten women from across the association’s global community personally honoured with an Inspirational ICCA Women award by ICCA President Nina Freysen-Pretorius. Freysen-Pretorius, the second female ICCA president, has been in the role for four years and finishes her tenure in 2018. Keen to show her gratitude to her industry partners from across the world for their support during her time as president of the global meetings industry association, Freysen-Pretorius reached out to colleagues in the ICCA leadership for their nominations of women they consider to the “unsung heroes”, leaders, innovators, pioneers and advocates of business events. Nominated for a variety of reasons, each woman was ultimately chosen for their dedication to the ICCA community and meetings industry, and because they exhibit the values and actions that the association encourages and upholds. Freysen-Pretorius paid individual tribute to each recipient of the Inspirational ICCA Women award during her President’s Choice session on Monday 12 November, presenting the ten women with their awards on stage. ICCA Interim CEO Dennis Speet said they all know women amongst the industry colleagues who go above and beyond to share their time, expertise and energy in supporting ICCA’s many initiatives and member opportunities. Without them, we would not be able to provide such a nurturing, welcoming environment for the global membership, he added. ICCA President Nina-Freysen Pretorius said that through her role as ICCA president, she has continuously sought to champion and encourage the achievements of women in business events. Gender equality in the workplace globally remains a challenge with unequal opportunities and remuneration packages a reality. Without female role models and champions seen as leaders, presidents, and activists as examples, women will not be able to take their rightful place in society at different levels, she concluded. The 2018 ICCA Congress is being held from 11-14 November 2018 in Dubai, United Arab Emirates. The largest edition of the event held outside of Europe, the Congress has 1,156 delegates from 79 countries in attendance.